Got this tag from the Power Girl...Twinkletoe. how I wish am really a "real" MAXIM Cover Girl. BUT WHY NOT??? even just in my dreams....toink!!! probably maxim magazine just did not discover me before..what do you think?? 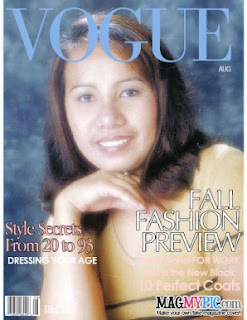 I put myself both in the Maxim and Vouge magazine...what's wrong anyway..it's my choice..
thanks to my friend Tchel (who is a Cosmo Cover Girl ) for tagging me with this one. Thanks to Magmypic for this wonderful tool that makes every girl's dream come true and that's to be a magazine cover girl. Who wouldn't want to be in a magazine anyway? and the best part...i'm tagging all bisdak friends and blogger friends!!! it's your chance to be a Mag Cover Girl now!! !